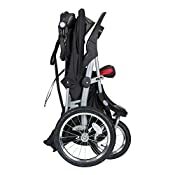 Head out for a jog with your child to set an example of a healthy lifestyle with the Baby Trend Expedition GLX Travel System, which features a front swivel wheel that locks in place for security while jogging. The parent tray offers two built-in MP3 speakers, so you can connect your compatible audio device and play lullabies to comfort your baby or fast-paced tempos to keep you motivated. 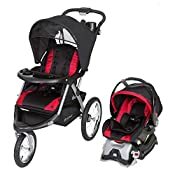 The multiposition, padded seat reclines, so your little passenger can sit up and see the world or lay back and rest as you stroll. 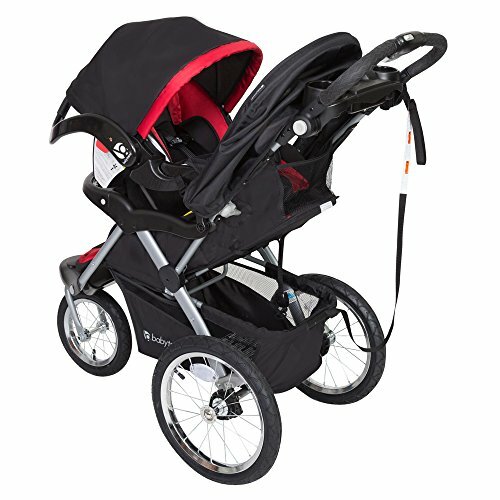 Additional features include a height adjustable handle, large peek boo canopy. Also an easy one hand fold for compact storage. 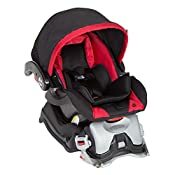 Be sure your little one is secure, whether you attach the included infant car seat to the stroller or put your baby right in the all-terrain jogger, using the five-point safety harnesses. The Flex Lock 32 lb car seat also features a Delta multigrip handle for easy portability between the car and the stroller. Car Seat base is also included. When you're finished with your invigorating morning run, the one-hand fold simplifies storage by minimizing the stroller's bulk. 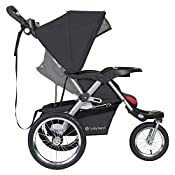 Recommended use (stroller): up to 50 lb. or up to 42",Recommended use (car seat): up to 32 lb. or up to 32"